Intensive care unit (ICU) equipment includes patient monitoring, respiratory and cardiac support, pain management , emergency resuscitation devices, and other life support equipment designed to care for patients who are seriously injured, have a critical or life-threatening illness, or have undergone a major surgical procedure, thereby requiring 24-hour care and monitoring. An ICU may be designed and equipped to provide care to patients with a range of conditions, or it may be designed and equipped to provide specialized care to patients with specific conditions. For example, a neuromedical ICU cares for patients with acute conditions involving the nervous system or patients who have just had neurosurgical procedures and require equipment for monitoring and assessing the brain and spinal cord. A neonatal ICU is designed and equipped to care for infants who are ill, born prematurely, or have a condition requiring constant monitoring. A trauma/burn ICU provides specialized injury and wound care for patients involved in auto accidents and patients who have gunshot injuries or burns. Intensive care unit equipment includes patient monitoring, life support and emergency resuscitation devices, and diagnostic devices. Acute care physiologic monitoring system—comprehensive patient monitoring systems that can be configured to continuously measure and display a number of parameters via electrodes and sensors that are connected to the patient. These may include the electrical activity of the heart via an EKG, respiration rate (breathing), blood pressure, body temperature, cardiac output, and amount of oxygen and carbon dioxide in the blood. Each patient bed in an ICU has a physiologic monitor that measure these body activities. 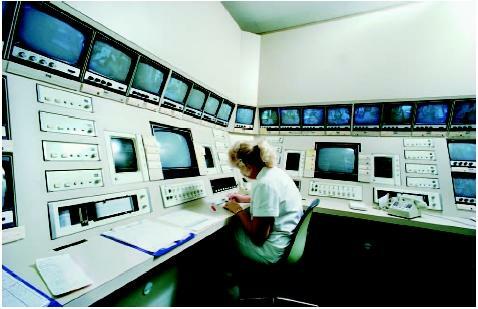 All monitors are networked to a central nurses' station. Pulse oximeter—monitors the arterial hemoglobin oxygen saturation (oxygen level) of the patient's blood with a sensor clipped over the finger or toe. Intracranial pressure monitor—measures the pressure of fluid in the brain in patients with head trauma or other conditions affecting the brain (such as tumors, edema, or hemorrhage). These devices warn of elevated pressure and record or display pressure trends. Intracranial pressure monitoring may be a capability included in a physiologic monitor. Apnea monitor—continuously monitors breathing via electrodes or sensors placed on the patient. An apnea monitor detects cessation of breathing in infants and adults at risk of respiratory failure, displays respiration parameters, and triggers an alarm if a certain amount of time passes without a patient's breath being detected. Apnea monitoring may be a capability included in a physiologic monitor. Ventilator (also called a respirator)—assists with or controls pulmonary ventilation in patients who cannot breathe on their own. Ventilators consist of a flexible breathing circuit, gas supply, heating/humidification mechanism, monitors, and alarms. They are microprocessor-controlled and programmable, and regulate the volume, pressure, and flow of patient respiration. Ventilator monitors and alarms may interface with a central monitoring system or information system. Infusion pump—device that delivers fluids intravenously or epidurally through a catheter. Infusion pumps employ automatic, programmable pumping mechanisms to deliver continuous anesthesia, drugs, and blood infusions to the patient. The pump is hung on an intravenous pole placed next to the patient's bed. Crash cart—also called a resuscitation or code cart. This is a portable cart containing emergency resuscitation equipment for patients who are "coding." That is, their vital signs are in a dangerous range. The emergency equipment includes a defibrillator, airway intubation devices, a resuscitation bag/mask, and medication box. Crash carts are strategically located in the ICU for immediate availability for when a patient experiences cardiorespiratory failure. Intraaortic balloon pump—a device that helps reduce the heart's workload and helps blood flow to the coronary arteries for patients with unstable angina, myocardial infarction (heart attack), or patients awaiting organ transplants. Intraaortic balloon pumps use a balloon placed in the patient's aorta. The balloon is on the end of a catheter that is connected to the pump's console, which displays heart rate, pressure, and electrocardiogram (ECG) readings. The patient's ECG is used to time the inflation and deflation of the balloon. Custom Medical Stock Photo. Reproduced by permission. analyzers, are used for blood analysis at the bedside. A small amount of whole blood is required, and blood chemistry parameters can be provided much faster than if samples were sent to the central laboratory. Disposable ICU equipment includes urinary (Foley) catheters, catheters used for arterial and central venous lines, Swan-Ganz catheters, chest and endotracheal tubes, gastrointestinal and nasogastric feeding tubes, and monitoring electrodes. Some patients may be wearing a posey vest, also called a Houdini jacket for safety; the purpose is to keep the patient stationary. Spenco boots are padded support devices made of lamb's wool to position the feet and ankles of the patient. Support hose may also be placed on the patient's legs to support the leg muscles and aid circulation. The ICU is a demanding environment due to the critical condition of patients and the variety of equipment necessary to support and monitor patients. Therefore, when operating ICU equipment, staff should pay attention to the types of devices and the variations between different models of the same type of device so they do not make an error in operation or adjustment. Although many hospitals make an effort to standardize equipment—for example, using the same manufacturer's infusion pumps or patient monitoring systems, older devices and nonstandardized equipment may still be used, particularly when the ICU is busy. Clinical staff should be sure to check all devices and settings to ensure patient safety. Intensive care unit patient monitoring systems are equipped with alarms that sound when the patient's vital signs deteriorate—for instance, when breathing stops, blood pressure is too high or too low, or when heart rate is too fast or too slow. Usually, all patient monitors connect to a central nurses' station for easy supervision. Staff at the ICU should ensure that all alarms are functioning properly and that the central station is staffed at all times. For reusable patient care equipment, clinical staff make certain to properly disinfect and sterilize devices that have contact with patients. Disposable items, such as catheters and needles, should be disposed of in a properly labeled container. Since ICU equipment is used continuously on critically ill patients, it is essential that equipment be properly maintained, particularly devices that are used for life support and resuscitation. Staff in the ICU should perform daily checks on equipment and inform biomedical engineering staff when equipment needs maintenance, repair, or replacement. For mechanically complex devices, service and preventive maintenance contracts are available from the manufacturer or third-party servicing companies, and should be kept current at all times. Equipment in the ICU is used by a team specialized in their use. The team usually comprises a critical care attending physician (also called an intensivist), critical care nurses, an infectious disease team, critical care respiratory therapists, pharmacologists, physical therapists, and dietitians. Physicians trained in other specialties, such as anesthesiology, cardiology, radiology, surgery, neurology, pediatrics, and orthopedics, may be consulted and called to the ICU to treat patients who require their expertise. Radiologic technologists perform mobile x ray examinations (bedside radiography). Either nurses or clinical laboratory personnel perform point-of-care blood analysis. Equipment in the ICU is maintained and repaired by hospital biomedical engineering staff and/or the equipment manufacturer. Some studies have shown that patients in the ICU following high-risk surgery are at least three times as likely to survive when cared for by "intensivists," physicians trained in critical care medicine. Manufacturers of more sophisticated ICU equipment, such as ventilators and patient monitoring devices, provide clinical training for all staff involved in ICU treatment when the device is purchased. All ICU staff must have undergone specialized training in the care of critically ill patients and must be trained to respond to life-threatening situations, since ICU patients are in critical condition and may experience respiratory or cardiac emergencies. Savino, Joseph S., C. William Hanson III, and Timothy J. Gardner. "Cardiothoracic Intensive Care: Operation and Administration." Seminars in Thoracic and Cardiovascular Surgery 12 (October 2000): 362–70. American Association of Critical Care Nurses (ACCN). 101 Columbia, Aliso Viejo, CA 92656-4109. (800) 889-AACN [(800) 889-2226] or (949) 362-2000. http://www.aacn.org . National Association of Neonatal Nurses. 4700 West Lake Ave., Glenview, IL 60025-1485. (847) 375-3660 or (800) 451-3795. http://www.nann.org . National Heart, Lung and Blood Institute. Information Center. P.O. Box 30105, Bethesda, MD 20824-0105. (301) 251-2222. http://www.nhlbi.nih.gov . National Institutes of Health, U.S. Department of Health and Human Services, 9000 Rockville Pike, Bethesda, MD 20892. (301) 496-4000. http://www.nih.gov . Society of Critical Care Medicine. 701 Lee St., Suite 200, Des Plaines, IL 60016. (847) 827-6869. info@sccm.org. http://www.sccm.org . ICU Guide. 2002. http://www.waiting.com/waitingicu.html . ICU-USA, Society of Critical Care Medicine, 2002 http://www.icu-usa.com/tour/ . "Intensive Care Units." 2003. http://www.pulmonologychannel.com/icu/index.html . Pediatric Critical Care Medicine http://pedsccm.wustl.edu/ . Virtual Pediatric Intensive Care Unit http://www.picu.net/ . I'm a Rwandese ,a student nurse in bacIII I want you would help to improve my knowledge and skills through my email above so as I may be able to make change in our HOSPITAL'ICU . Then I thank you for your help ,if possible you may help in training. Your artical gives lot of information about icu equipments but as i am student of hospital administraion i want to know about the maintainance part of that instrument like how the services are provoided. i also want to know the procedure of maintainance. kindly give authoritative conclusions of studies done related to safety/risks of use of handheld devices (mobile phones) in intensive care unit. I'm a student in Hospital administration. This artical has lot of important information. Will appreciate if you have more information regarding the supply chain management as well. Is there any justification for in room emergency equipment to include an AMBU bag vs a mouth piece mask for front line responders in the hospital setting? Emergency cart has an AMBU bag but not immediately available for initial responder. how do you conduct monitoring in icu ? how do you prevent it? -we have required a List of equipment for an eight badded surgical ICU. How much is the consolidated diagnostic machine to which patients are conected in the ICU? I am a student nurse in Tanzania, i am real thankful for the articke, it has helped me much in my research. as i was looking out for the posible causes of poor quality ICU at our Hospital. may God bless you. I would like to know the list of equipment for a 8-10 bedded surgical ICU.